MANILA -- Malacañang on Friday said Rappler chief executive officer Maria Ressa should stop using press freedom as an excuse to attack the administration of President Rodrigo R. Duterte for her arrest. "She cannot be complaining that this is again a violation of press freedom. Press freedom has nothing to do with the charges against Ms. Ressa. She is charged of a crime, and there is a determination of probable cause, hence a warrant of arrest has been issued. She should concentrate on defending herself in court. She cannot be always using the freedom of the press as an excuse to attack the administration," Presidential Spokesperson Salvador Panelo said in a briefing. Panelo reiterated that due process was followed in Ressa's arrest. "She is complaining again that she’s being arrested. All are equal before the law. She wants to be treated differently – that cannot be done. All warrants of arrest issued by competent courts are to be served the way it was served to her this morning. And warrants of arrest are not issued unless the courts’ judges determine there is a probable cause – which means, due process has been observed," he said. Two female police officers served Ressa an arrest warrant upon her arrival at the Ninoy Aquino International Airport (NAIA) for violation of the Anti-Dummy Law, in connection with the issuance of Rappler's shares to the United States-based lobby group, Omidyar Network Fund, which is a violation of the Constitution. Ressa was brought to the Pasig City Police headquarters for booking procedure. 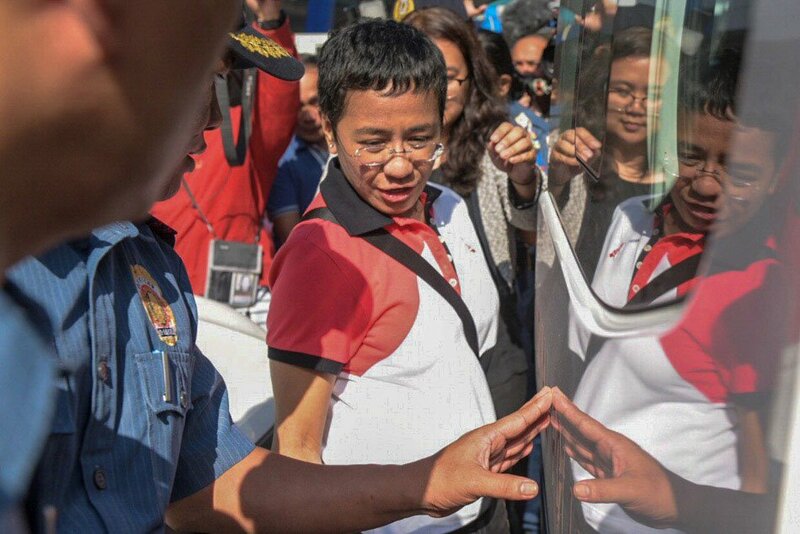 At 7:02 a.m., Ressa posted a tweet while she was being transported to the Pasig Regional Trial Court. Aside from Ressa, fellow Rappler officers and members Manuel I. Ayala, Nico Jose Nolledo, Glenda Gloria, James C. Bitanga, Felicia Atienza, and James Velasquez, are also facing charges.